California Council on Science and Technology (CCST) - A nonpartisan, impartial, not-for-profit corporation established via Assembly Concurrent Resolution (ACR 162)  [.pdf] to provide objective advice from California's best scientists and research institutions on policy issues involving science. CCST's goals are to ensure that decision making is informed by science, and to be a catalyst for scientists to engage in public policy. California Institute for Federal Policy Research - "The Institute's mission is to identify issues critical to the economic health of California, to coordinate the development of research data pertaining to these issues, and to communicate this policy research information to the California Congressional delegation." California Institute for Water Resources (University of California) - "Facilitating collaborative research and outreach on water issues across California's academic institutions and with international, federal, state, regional, nonprofit, and campus communities." California Policy Research Center (University of California) - "A systemwide research and public service program charged with applying the extensive research expertise of the UC system to the analysis, development and implementation of state policy and federal policy issues of statewide importance." California Research Bureau (California State Library) - "Provides nonpartisan, confidential research to the Governor's Office, members of both houses of the Legislature, and other state constitutional officers." California Studies Association - An independent, interdisciplinary organization dedicated to the study and exchange of ideas about California, past and present, its people, politics, economy, environment, arts, history, and literature. Center for California Studies (California State University, Sacramento) - "A public service, educational support, and applied research institute. dedicated to promoting a better understanding of California's government, politics, peoples, cultures and history." Center for the Continuing Study of the California Economy (CCSCE) - Independent, private economic research organization specializing in the analysis and study of California. CCSCE activities include research projects on the California economy; CCSCE's annual series of projection reports; customized long-term economic and demographic projections; database products; and senior management briefings, presentations, and speeches. CCSCE also participates as a research partner in public policy projects related to economic and demographic trends in California. Institute of Urban & Regional Development (University of California, Berkeley) - Conducts "research into processes of urban and regional growth and decline, and effects of governing policies on the patterns and processes of development." Jesse M. Unruh Institute of Politics (University of Southern California) - "Conducts a variety of programs that permit students to interact with public officials to learn about the issues that affect them and their community." Pacific Institute - Interdisciplinary research and partner with stakeholders to produce solutions that advance environmental protection, economic development, and social equity-in California, nationally, and internationally. Pat Brown Institute of Public Affairs (California State University, Los Angeles) - "Dedicated to continuing the progressive urban legacy of former California Governor Edmund G. "Pat" Brown (1959-1967), and serving as the primary vehicle through which Cal State L.A. carries out its urban mission." Policy Analysis for California Education (PACE) - "An independent policy research center whose primary aim is to enrich education policy debates with sound analysis and hard evidence." Public Policy Institute of California (PPIC) - "A private nonprofit organization dedicated to independent, objective, nonpartisan research on economic, social and political issues that affect the lives of Californians." Tomas Rivera Policy Institute (Claremont Graduate School) - "Conducts and disseminates objective, policy-relevant research and its implications to decision makers on key issues affecting Latino communities." Southern California Studies Center (University of Southern California) - "Goal is to monitor and guide the transformations in environment, politics, economics, culture and society of Southern California." University of California Agricultural Issues Center (University of California, Davis) - "A forum where crucial trends and policy issues affecting agriculture and natural resources in California and the West are analyzed and the results made available to both policymakers and to those affected by policies." University of California Berkeley Center for Fire Research and Outreach - Provides a forum for coordination on emerging research and tools regarding wildland fire in California. Yahoo! Get Local (California) - Click on lists for counties/regions and cities. Official sites, if available, are in the "Community" category. California City Finance (Sponsored by the League of California Cities) - Data, statistics, analyses, and articles on California city and county finance. California Local Codes and Charters (IGS Library, University of California Berkeley) - List of California city and county ordinance codes, with links to online versions. California Local Government Documents (IGS Library, University of California Berkeley) - Collects and preserves born-digital publications from local governments within California. CalNews - "News, politics & more." On the Record - Water news in California. Newspaper Directory: Newslink - California newspapers directory. TV Schedule: California - Provided by zap2it. California Ballot Initiatives Database (1911 onward) (Hastings College of the Law Library) - Includes "the full text of the initiatives, accompanying material relating to their filing & qualification, related legal and legislative history, and digital images of pertinent documents." California Ballot Propositions Database (1911 onward) (Hastings College of the Law Library) - Includes "the full text of the propositions, accompanying material contained in the voters' pamphlets, related legal and legislative history, and digital images of the voters' pamphlets." California Ballot Measures (1944 onward) (Barbara Friedrich, Santa Clara University) - A list of the propositions by election, with identifying catchwords. Notes whether the proposition passed or failed. California Online Voter Guide (Nov. 1994 onward) (California Voter Foundation) - Includes candidate information. Scroll down to desired guides. Easy Voter (A project of the League of Women Voters of California) -Nonpartisan information for new voters and busy voters in California." Includes candidate information. Initiative Update (Secretary of State) - Notes the latest initiatives in circulation and initiatives that have qualified for the next election. Cal-Access - California Automated Lobbying and Campaign Contribution & Search System (2000 Primary Election onward) (Secretary of State) - Provides access to names of candidates and committees raising or spending $50,000 or more ($100,000 or more for the 2000 primary only). Follow the Money (Institute on Money in State Politics) - Database for tracking interest group campaign contributions in state elections. California coverage begins with 1998. Digital Sunlight (California Voter Foundation) - Electronic Filing + Internet Disclosure = Digital Sunlight." OpenSecrets.org : California (Center for Responsive Politics) - 1998 onward. Finance data on U.S. Senate and House races, and on California contributions to presidential campaigns. Voter Registration - Information about registering to vote in California. Voter Registration Statistics - The California Secretary of State is required by law to produce a Report of Registration detailing voter registration levels throughout California at specific times prior to each statewide election and once during odd numbered years. California Elections Data Archives (Center for California Studies, and Institute for Social Research, California State University, Sacramento) - A repository of California local election data from 1995 onward. Includes candidate and ballot measure results for county, city, community college and school district elections. Data for 1999 onward is available online. Data for 1995-1998 is available in printed reports. County, City, School District & Ballot Measure Election Results (Secretary of State) - A joint project of the Center for California Studies and Institute for Social Research of California State University, Sacramento, and the Secretary of State. Collects and compiles results from city, county, school district, and local ballot measure elections from 2000-Current. Qualified Political Parties (Secretary of State) - List of political parties meeting the requirements of the California Elections Code. California Voter Foundation - "A clearinghouse of nonpartisan political information providing the public with convenient, 24-hour access to the "raw materials" of democratic life. CVF's web site and voter guides are easy to navigate, free to users and free of advertisements." League of Women Voters of California Politics - Directory of candidates and state news sources. Smart Voter (League of Women Voters of California) -Offers extensive background information on candidates in participating counties as well as information on state and local ballot measures." Was the first site to offer personalized election information based on a voter's address. UCLA Online Campaign Literature Archive (UCLA Library) - Online digital archive of California campaign materials, with a focus on Los Angeles, dating from 1908. Field Poll (Field Institute) - Prominent nonpartisan statewide poll. Press releases from the poll are online, 1993- . Called the California Poll until July 1992. The Social Sciences Data Collection at U.C. San Diego maintains a database of questions from the Field Poll, 1979- present. Los Angeles Times Polls - National, statewide and local polls. Includes archive dating back to 1992. PPIC Statewide Surveys (Public Policy Institute of California) - Launched in 1998 with the purpose of "providing independent, objective information on the social, economic, and political forces affecting California elections and public policy preferences." Survey and Policy Research Institute (San Jose State University) - Produces the California Consumer Confidence Survey, the Silicon Valley Consumer Confidence Survey, and polls on various other topics. 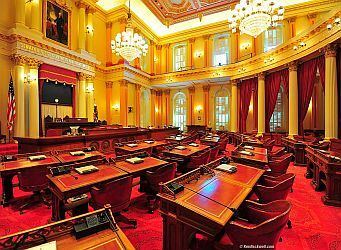 California Common Cause - "A 35,000-member, non-profit, non-partisan organization that lobbies for campaign finance and ethics reform at both the state and local level in California." California Housing Partnership Corporation (CHPC) - A private nonprofit organization dedicated to helping government and nonprofit housing agencies preserve and expand the supply of affordable homes for lower-income households throughout California. California Public Interest Research Group (CALPIRG) - Advocate for the public interest. Center for Governmental Studies - "Designs and helps implement innovative approaches to improve the processes of media and governance. The Center also works in substantive areas of campaign finance, ballot initiatives, digital divide, higher education, health care and state and local finance." Claremont Institute - "The mission of the Claremont Institute is to restore the principles of the American Founding to their rightful, preeminent authority in our national life." Community Collaboration - A resource for "building community collaboration and consensus." Courage Campaign - Online community fighting for a for a more progressive California and country. InterEnvironment Institute - Main focus is on the natural environment, both internationally and in the United States, particularly in California. Pacific Research Institute for Public Policy - "Promotes the principles of individual freedom and personal responsibility. The Institute believes these principles are best encouraged through policies that emphasize a free economy, private initiative, and limited government." Public Policy Institute of California (PPIC) - Projects cut across a wide range of policy concerns, such as immigration, education, governance, the environment, and economic development. State Water Board Drought Year Water Actions - Information from the State Water Resources Control Board. Bay Area Economic Forum - A forum for high-level regional leaders to examine and take action on economic issues impacting the entire Bay Area. Beacon Economics - Specializes in economic and revenue forecasting, economic impact analysis, regional economic analysis, real estate market analysis, industry analysis, and economic policy analysis. California Alliance for Jobs ReBuild California - "A leading advocate for the heavy construction industry." California Reinvestment Coalition (CRC) - Advocates for the right of low-income communities and communities of color to have fair and equal access to banking and other financial services. CRC has a membership of more than 240 nonprofit organizations and public agencies across the State. Center for Continuing Study of the California Economy (CCSCE) - A private research organization founded in 1969 to provide an independent assessment of economic and demographic trends in California. Civil Justice Association of California (CJAC) - Industry-sponsored California group, advocating legal reforms to restrict tort recovery. Acterra - "Action for a sustainable earth." Formerly Bay Area Action & Peninsula Conservation Center Foundation. Bay Institute of San Francisco - Mission is to "protect and restore the ecosystems" of San Francisco Bay and the delta region. CALFED Bay-Delta Program California Center for Regional Leadership - "A statewide nonprofit organization established to support, facilitate, and promote innovative regional solutions for our major economic, environmental, and societal challenges, to help achieve a more sustainable California." California Council for Environmental and Economic Balance - "A coalition of California business, labor and public policy leaders who work together to advance collaborative strategies for a sound economy and a healthy environment." California Environmental Dialogue - "A collaborative effort of leaders from California corporations, environmental organizations and governments" addressing "today's challenging environmental issues-solutions supported by a broad spectrum of interests." California Foundation on the Environment and the Economy - "Dedicated to educating public and private sector decision makers on, and developing creative solutions to California's complex economic, environmental and social issues." California Futures Network - "A statewide coalition of organizations working to achieve land use policies that are fiscally, socially and environmentally sound." California Land Use Planning Information Network (LUPIN) (California Resources Agency) - An information service to support and address California land use and planning. California Natural Resources Agency / Map Server (California Legacy Project) - The purpose of this site is to provide map services for departments, boards and commissions within the Natural Resources Agency, and also to make some of these services available to the public. California Planners' Book of Lists (1996 onward) (Governor's Office of Planning and Research) - Annual directory of California local planning agencies with lists of latest versions of city and county plans. California Wildlife Foundation (CWF) - Supports programs of the California Department of Fish and Game and its agency and resources partners. Manages funds designated to strengthen the stewardship efforts and long-term management of publicly-held wildlife areas and reserves. Central Coast Alliance United for a Sustainable Economy (CAUSE) - A egional organization for social, economic and environmental justice..
Environmental Working Group - California - "Dedicated to protecting the citizens of California, particularly California's children, from the effects of pesticides and other toxic chemicals." Great Valley Center - Mission is to "support activities and organizations that promote the economic, social, and environmental well-being of California's Great Central Valley." Greenbelt Alliance - "Our mission is to make the nine-county San Francisco Bay Area a better place to live by protecting the region's Greenbelt and improving the livability of its cities and towns." Impacts of Sea-Level Rise on the California Coast - This Pacific Institute report concludes that sea-level rise will inevitably change the character of the California coast, and that adaptation strategies must be evaluated, tested, and implemented if the risks identified in the report are to be reduced or avoided. Populations and critical infrastructure at risk are shown in detailed maps prepared by the Pacific Institute available online here. The report also explores how vulnerability to sea-level rise will be heightened among Californians who do not have a vehicle, do not speak English, or who live near hazardous waste facilities. Low-income households and communities of color are over-represented in these more vulnerable groups. Pacific Institute - Works to create a healthier planet and sustainable communities. We conduct interdisciplinary research and partner with stakeholders to produce solutions that advance environmental protection, economic development, and social equity-in California, nationally, and internationally. San Francisco Beautiful San Francisco Tomorrow - "An urban environment organization." Save-the-Redwoods League - Working to protect and restore redwood forests. StopFoolingCA - Taking action against Big Oil in California. California Drought - A project of the Pacific Institute in Oakland, California, one of the world's leading independent nonprofits researching and finding solutions to freshwater issues. The website compiles tools, research, and information on the California drought to facilitate the work at every level to understand, plan for, and find sustainable water management solutions in the face of a drier future for the western United States with changing conditions from climate change. California Water Rights - An interactive map of water rights held in California. California Water Commission - Provides a public forum for discussing water issues, advises the Department of Water Resources (DWR), and takes appropriate statutory actions to further the development of policies that support integrated and sustainable water resource management and a healthy environment. Statutory duties include advising the Director of DWR, approving rules and regulations, and monitoring and reporting on the construction and operation of the State Water Project. California Water Systems - California water districts and water resources provided by the Natural Resources Defense Council. Department of Water Resources - Manages the water resources of California in cooperation with other agencies. Water Education Foundation - "Your resource for information about water resource issues." Advancement Project - Works alongside community activists and policymakers to generate momentum for evidence-based solutions in education, health, public funding, and public policymaking. California Catholic Conference - "Official voice of the Catholic community in California's public policy arena." California Expose - Privatization of public schools and attacks on unionized workplaces and middle-class wages are only some of the trends threatening the Golden State. In this Frying Pan News investigative series, Pulitzer Prize-winning journalist Gary Cohn examines the stories and personalities behind events shaping - and distorting- its communities. California Healthcare Information Division: Annual Financial Data Hospital Chargemasters - A hospital charge description master, also known as a chargemaster or CDM, contains the prices of all services, goods, and procedures for which a separate charge exists. It is used to generate a patient's bill. As required by the Payers' Bill of Rights, each hospital is required to submit a copy of its chargemaster, a list of average charges for 25 common outpatient procedures. Californians for Population Stabilization - Addresses issues of population growth related to high fertility and high immigration rates. Calpensions - A project of Ed Mendel, a reporter who covered the Capitol in Sacramento for nearly three decades. The main focus of Calpensions.com is the pair of big pension funds based in Sacramento, the California Public Employees Retirement System and the California State Teachers Retirement System, which have two of the world's largest investment portfolios. There also are more than 80 smaller public employee pensions funds in California. Among them are 22 pension funds operated by counties, 32 by cities and 25 by special districts. Children Now - "We examine social and governmental structures to see how well they support children and families, particularly those with fewer financial resources." Curb Prison Spending - A broad-based coalition of over 65 organizations seeking to curb prison spending by reducing the number of people in prison and the number of prisons in the state. EdSource - "Dedicated to providing impartial, clearly presented information about California's emerging public education issues, including school finance, to wide and diverse audiences." Friends Committee on Legislation - "A non-profit lobbying organization (established in 1952) whose mission is to educate state lawmakers and the public about peace and justice and the worth of every individual." Public Schools Accountability Act (PSAA) - Passed in California in 1999, ostensibly as a first step in developing a comprehensive system to hold students, schools, and districts accountable for improving student performance. Also see California Code - Chapter 6.1: Public Schools Accountability Act of 1999 [52050. - 52059.]. California Budget & Policy Center - Iindependent source of information on how budget and tax policies affect low- and middle-income Californians. Cal-Tax - California Taxpayers' Association - "Founded in 1926, our mission is to protect taxpayers from unnecessary taxes and to promote efficient, quality government services." Foundation for Taxpayer & Consumer Rights - Founded in 1985 by Harvey Rosenfield. FTCR's aim is to "to advance and protect the interests of consumers and taxpayers." California Non-Profit Organizations (Action Without Borders) - To search for California organizations, click on "United States," then "California" in the Browse box. San Francisco Bay Area Progressive Directory (Ken Cheetham) -A guide to about 1000 organizations in the San Francisco Bay Area of interest to progressive activists." Little Hoover Commission - Official name is the Milton Marks "Little Hoover" Commission on California State Government Organization and Economy. State Water Resources Control Board - California water quality and rights regulation, board meetings, laws, funding, watershed management, enforcement, citizen involvement, news and education. California Roster (Secretary of State) Directory of state officeholders and agencies, and city and county governments. Governor's Gallery (California State Library) - Each entry includes a brief bibliography, official portrait, inaugural addresses, and a timeline of major events which occurred during the governor's tenure. Bills, 1993- (Legislative Counsel) - Searchable full-text database. Statutes, 1993- (Legislative Counsel) - Searchable full-text database. Statutes, 1850-1992 (Assembly Office of the Chief Clerk) - Full-text. Also includes: Assembly Journals, 1849-1993; and Histories and Indexes, 1881-1995. Codes (Legislative Counsel) - California's 29 subject-based codes, searchable by keyword and via tables of contents. Legislative Histories, Assembly and Senate, 1881-1995 (Assembly Office of the Chief Clerk) - Full-text. Also includes: Assembly Journals, 1849-1993; and Statutes, 1850-1992. Locating the Law (4th ed., 2001) (Southern California Association of Law Libraries) -A handbook for non-law librarians, with an emphasis on California law." California Case Law, 1934-Present (FindLaw & AccessLaw) - Free access to California Supreme Court and appellate court case law. California Courts (Official site of the judicial branch of California) - Includes "slip opinions published by the California Supreme Court and the California Courts of Appeal in the last 100 days." The Recorder - Subscription service providing daily access to "local court rules, state and federal appellate opinions, and information on all cases before the state Supreme Court. California Political Almanac - Print. Biennial. Profiles of state legislators. Earlier editiions online. Earlier volumes at IGSL and Doe Reference desks. Capitol Enquiry, Inc.: GovBuddy - Publisher of California state government directories. The California Channel - Public affairs programming, including live coverage of the California Legislature. Budget Documents - The Governor's Budget, the Salaries and Wages Supplement, and other documents, including the May Revision and Final Change Book. California County Profiles - Annual compilation of "selected economic, social, and demographic data for California and its 58 counties." California Demographics - From the Demographic Research Unit, designated as "the single official source of demographic data for State planning and budgeting." California Economic Indicators - "A bimonthly summary ofeconomic trends and data." Economic Report of the Governor - Includes extensive statistical section. California Latino Demographic Databook (U.C. Data) - Features data from the California Policy Research Center's publication of the same title. California Statistics (RAND California) - Subscription service providing a range of Calfiornia statistical data. Center for Continuing Study of the California Economy - CCSCE focuses on long term economic and demographic trends in the state and its major economic regions. Center for Health Statistics (California Dept. of Health Services) - Vital statistics and other population data. Consumer Price Indexes (U.S. Bureau of Labor Statistics) - Includes CPI data for three California regions: Los Angeles-Riverside-Orange County, San Diego, and San Francisco-Oakland-San Jose. Counting California (California Digital Library) - Uses a single interface to provide access to a range of California statistics from federal, state and local government sources. Criminal Justice Statistics: Key Facts (California Attorney General's Office) - Also see Statistics by City and County. Ed-Data (Education Data Partnership) -Fiscal, demographic and performance data on California's K-12 schools." Immunization Levels in Callifornia Child Care and Schools (California Department of Public Health) - California Health and Safety Code Section 120375 and California Code of Regulation Section 6075 require all schools and child care facilities to assess and report annually the immunization status of their enrollees. This webpage provides the most recent summary reports and data files measuring compliance with this school immunization law, conducted in licensed child care facilities and all schools with kindergartens and/or 7th grades. Individual facility/school data is only presented for facilities/schools with 10 or more students. State Health Facts Online - California (Henry J. Kaiser Family Foundation) - "Contains the latest state-level data on demographics, health, and health policy, including health coverage, access, financing, and state legislation." Transparent California - Dedicated to providing accurate, comprehensive and easily searchable information on the compensation of public employees in California. This webpage last updated on Saturday, January 5, 2019 7:09 AM.